These PinoyInvestor sections are primarily based on Fundamental Analysis and, as such, may only be relevant to long-term investors. 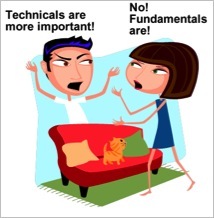 (Learn more about Fundamental Analysis in the PinoyInvestor Academy.) Check out each section below for more details on how you can use PinoyInvestor to succeed as a long-term investor! Short-term traders may also consider these sections but should remember that these information are primarily long-term in nature and may not necessarily impact their short-term trading strategy. 1. 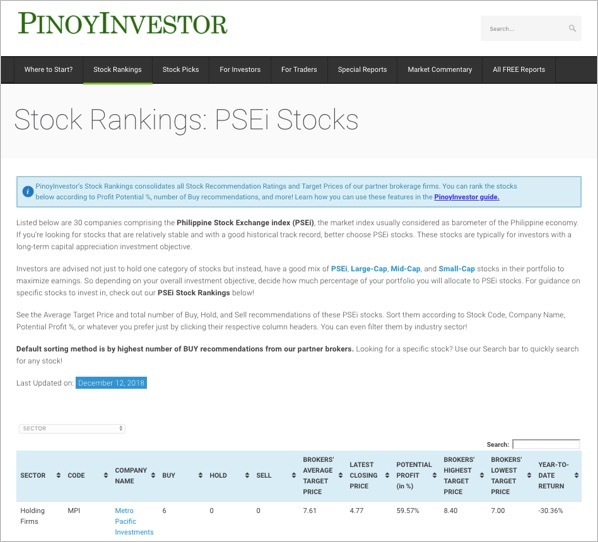 PSE index (PSEi) Stock Rankings are made up of 30 companies that are part of the PSE index (PSEi), the market index usually considered as barometer of the Philippine economy. If you’re looking for stocks that are relatively stable and with a good historical track record, better choose PSEi stocks. These stocks are typically for investors with a long-term capital appreciation investment objective. 2. Our Large-Cap Stock Rankings is comprised of Large-Cap stocks in the PSE, or those with market capitalization of at least PHP 100 billion. Large-Cap stocks tend to be more stable than any other categories of stocks. Many of them also pay dividends, providing additional income to shareholders. Large-caps are typically suited for investors looking for current income and driven by the goal of capital preservation. Historically, this type of stocks outperforms small-cap stocks during times of recession and bearish periods. REMINDER! Our Mid-Cap Stock Rankings and Small-Cap Stock Rankings are usually intended for short-term traders. For more details how short-term traders can use PinoyInvestor, head over to Using PinoyInvestor for Short-Term Trading. 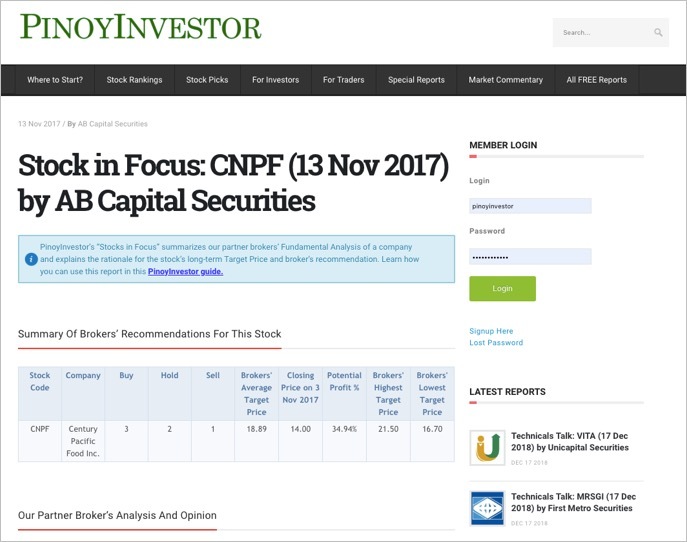 Primarily based on Fundamental Analysis, the Stock in Focus section shares our partner brokers’ detailed analyses of a company and explains the rationale for its Target Price, Buy / Sell / Hold recommendation, and future prospects. See the guide photos below for details on the content of our “Stock in Focus” reports. 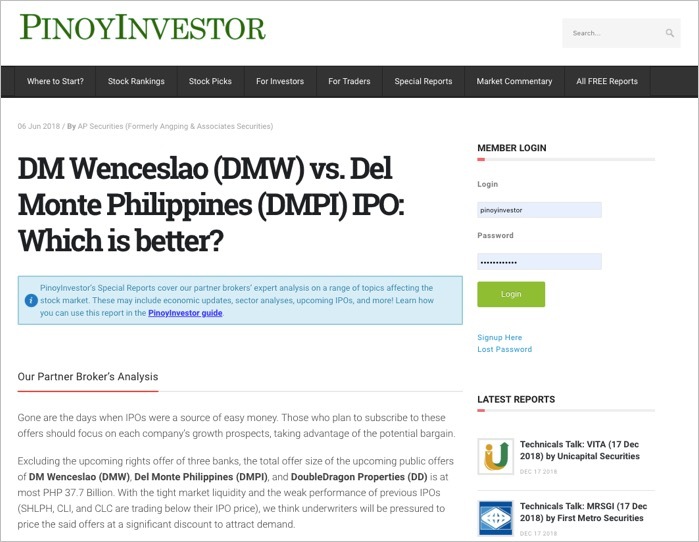 PinoyInvestor’s Special Reports cover our partner brokers’ analysis and opinion on various topics that affect the stock market. These may be industry analyses, economic updates, upcoming IPOs, and more — anything that can help you understand the stock market and the factors that impact the recommendations of a stock. View our Special Reports here! 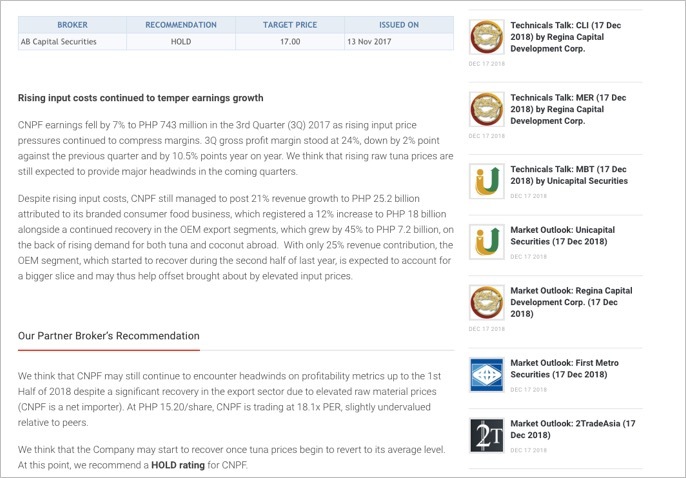 Don’t forget that each stock in PinoyInvestor has its own dedicated page containing all reports published for that stock! You can search for them in our Search bar or you can go to our List of PSE Stocks page to see the dedicated page of your preferred stock. See, for example, below how Jollibee Foods Corporation’s (JFC) dedicated stock page looks. It’s got everything you need to decide whether you should Buy, Hold, or Sell JFC’s stock! To maximize earnings, investors are advised not just to hold a single category of stocks. It would be better to have a portfolio containing a good mix of PSEi, Large-Cap, Mid-Cap, and Small-Cap stocks. So depending on your overall investment objective, decide how much percentage of your portfolio you will allot to PSEi, Large-Cap, Mid-Cap, and Small-Cap stocks! For example, if you are a conservative investor that prefers stability of returns rather than volatility of prices, then buy more stocks coming from the PSEi and Large-Cap Stock Rankings! If, on the other hand, you’re willing to take in more risks (which means you’re OK with the possibility of loss) in exchange for potential huge income, you might want to have a portfolio with more stocks coming from the Mid-Cap and Small-Cap Stock Rankings! When Will Stocks Reach Their Target Prices? Frankly speaking, there is no assurance that stocks will always reach their target prices. But trust our partner brokers to put in a lot of effort in making sure that the stock reports you read are useful in your investment decisions. Typically, the Average Target Prices mentioned in our stock reports are valid for a few months to 1 year. This means, our partner brokers usually expect stocks to reach their Target Prices within one (1) year. Do note, though, that Target Prices may change instantly due to major changes in the economic environment or the company’s operations. Thus, we encourage you to regularly monitor the Stock Rankings and Stock in Focus reports. Although Target Prices normally have a horizon of 1 year, if you stay true to long-term investing, you actually can reap more financial rewards in the future! To give you an example, Megaworld Corp. (MEG) used to trade at less than PHP 1.00 back in 2005. As of 2015, MEG is trading close to PHP 5.00. If you bought MEG in 2005 and held it until now, you are now making a huge 400% profit! That’s the power of long-term investing! Target Prices may take some time before they are reached, thus, you will need to have PATIENCE. The market rises and declines as part of its regular cycle. 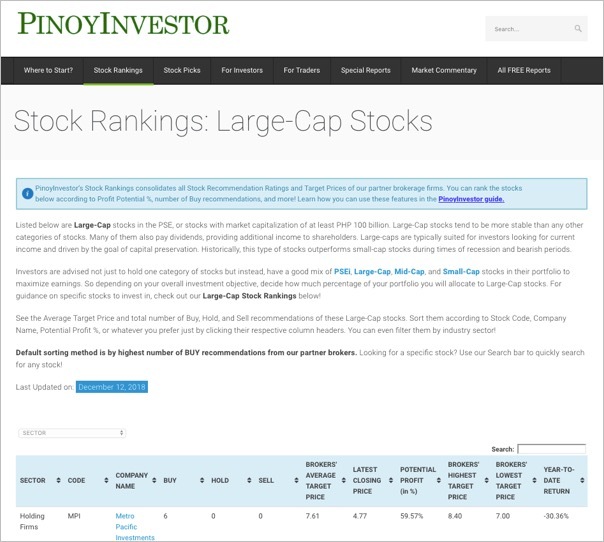 Still, remember that there is NO GUARANTEE that Target Prices will always be reached, but you can count on PinoyInvestor to give you updated recommendations when major economic and business changes impact the Target Prices of stocks. Where is the 'Buy Below' Price? Where is the ‘Buy Below’ Price? 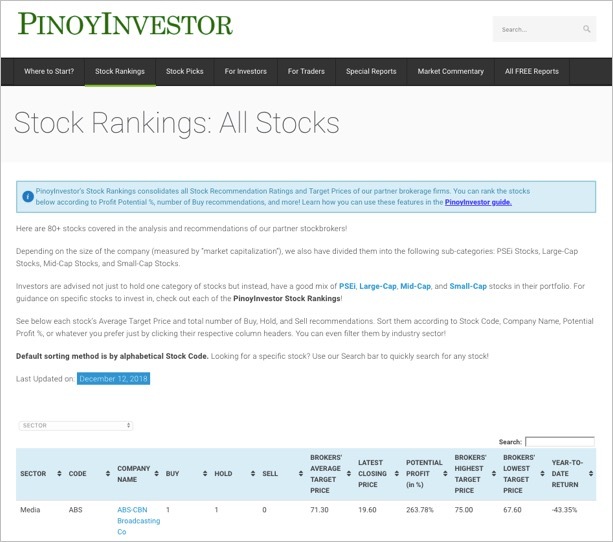 You probably have noticed that PinoyInvestor’s Stock Rankings (and our other stock reports) do not contain a “Buy Below Price”. Nor do we dictate to you when to make a Buy or Sell order. Why? We recognize that to be a truly intelligent and independent investor, you must possess the flexibility to decide for yourself your desired profit percentage and entry/exit points. We will teach you and help you grow as a mature investor, but in the end you have to make your own smart and independent decisions. We will NOT treat you like robots with no minds of your own. 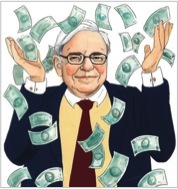 That’s the mark of a truly smart stock investor! Still, if you want to be guided by a “Buy Below Price,” you can apply this very easily in PinoyInvestor! Usually the “Buy Below Price” is 12% lower than our Average Target Price. For example, if our partner brokers’ Target Price is PHP 10.00, your “Buy Below Price” will be PHP 8.80. We computed this as PHP 10.00 times the quantity (100%-12%). This gives you 88% times PHP 10.00, which yields the “Buy Below Price” of PHP 8.80.